Please select, in the freight option at CHECKOUT, an NZ Couriers pre-paid courier ticket, to your geographic area, to allow us to pack the glass shisha in a buffered carton to safely transport it to you. 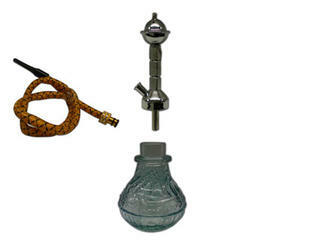 Shisha tobacco pipe with 1 hose & light function - no case - assorted colours - 200mm (approx) high. Small, fits in the palm of your hand. 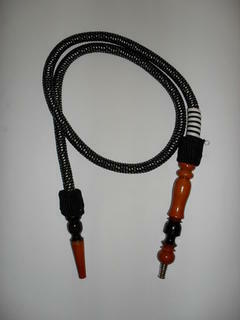 Shisha tobacco pipe with 1 hose but no aluminium carry case - assorted colours 220mm (approx) high. 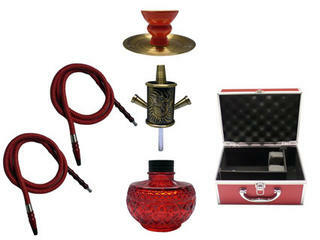 Shisha tobacco pipe with 1 hose and light but no aluminium carry case - assorted colours 330mm (approx) high. Shisha tobacco pipe with 1 hose, solid dragon sculptured around centre stem & aluminium carry case - assorted colours 425mm (approx) high. 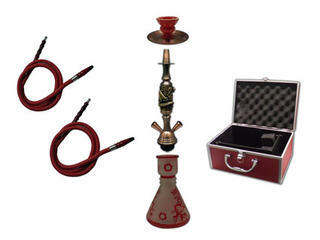 Shisha tobacco pipe with single hose - light function & aluminium carry case - assorted colours 450mm (approx) high. 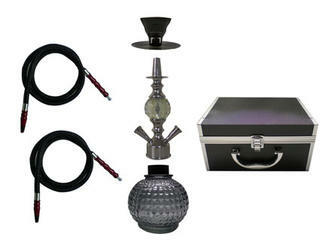 Shisha tobacco pipe with 1 hose & larger aluminium carry case - assorted colours 620mm (approx) high. 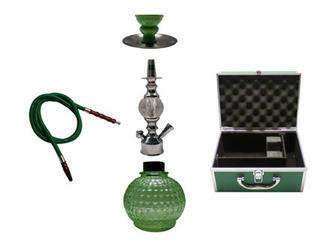 Shisha tobacco pipe with glass stem, 2 hoses & aluminium carry case - assorted colours - 560mm (approx) high. 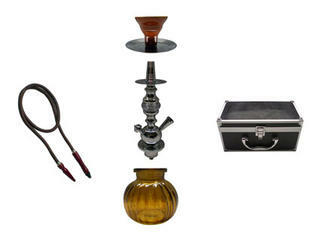 Shisha tobacco pipe with 2 hoses, anodised bronze centre and plate & aluminium carry case - assorted colours 220mm (approx) high. Shisha tobacco pipe with 2 hoses, solid dragon sculptured around centre stem & aluminium carry case - assorted colours 425mm (approx) high. 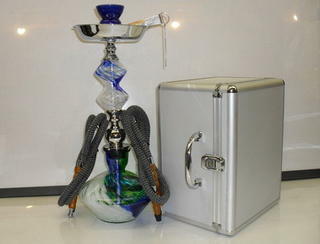 Shisha tobacco pipe with glass stem, 2 hoses & aluminium carry case - assorted colours - 460mm (approx) high. 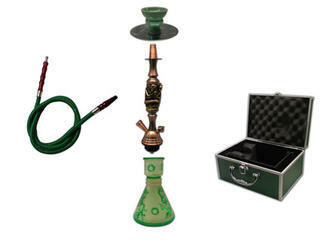 Shisha tobacco pipe with 2 hoses, anodised copper centre and plate & aluminium carry case - assorted colours 220mm (approx) high. 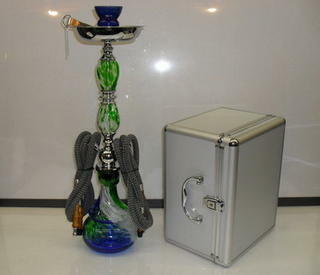 Shisha tobacco pipe with 2 hoses, anodised pewter centre and chromed plate & aluminium carry case - assorted colours 220mm (approx) high. 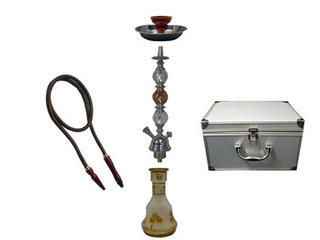 Shisha tobacco pipe with 2 hoses & aluminium carry case - assorted colours 620mm (approx) high. 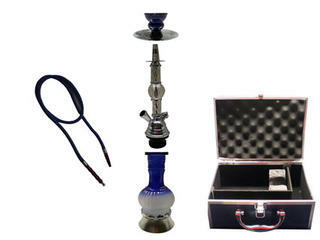 Shisha tobacco pipe with 3 hoses & larger aluminium carry case - assorted colours 620mm (approx) high. 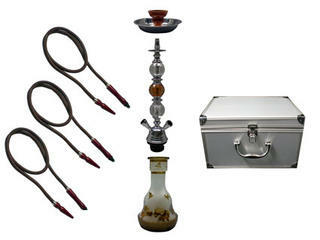 Authentic Middle Eastern style Shisha pipe with strong cast chromed metal stem kit, ceramic censer, coloured glass bowl, tongs and poker, washable acrylic 1.5m hose and carburettor/vent. Assorted designs and colours. Overall height approx 470mm. Bowl diameter 140mm. 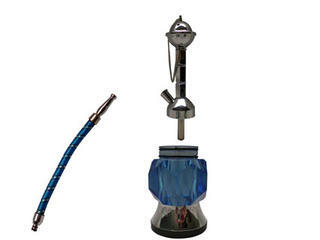 This is a very good medium shisha unit with the solid crush-resistant stem threaded and screwed into a threaded metal glued insert in the heavy glass bowl. No more having the base drop off the stem when lifting carelessly. The carburettor unit that can be adjusted to vary the air flow and prevents blow-back using an acrylic ball, can be detached and replaced with another hose assembly and hose to provide a twin hose option. Very robust handsome unit, complete with matching colour carry case. Availability of styles and colours is dependent upon supply from the Middle East (Iran). 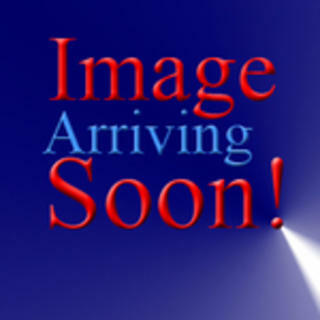 Hose images shown are indicative only. Lengths approx. 1.5 to 2.0 m.